Have you been thinking about making your own homemade glass and window cleaner? Have you already checked out a few recipes that use vinegar, rubbing alcohol, dish soap, cornstarch, or ammonia? Before you take the plunge and try one of those recipes, or even if you’ve been using one of those recipes for a while already, you might be interested to know that there’s a simpler and easier way to make homemade glass and window cleaner, and it works better than those other recipes too. What is it? I know, I know, it seems like there should be some measuring or stirring or something involved if you’re making your own glass cleaner, but I’ve found that straight club soda really does a great job on mirrors, windows, and more! It’s one of my favorite homemade glass cleaners. Club Soda is one of three easy ways you can switch to homemade cleaners, and this post will take a closer look at how it can be used. Thankfully she tried club soda and then shared her discovery with the rest of us. And here’s my own great discovery . . . . The squirt top of a spray bottle will screw right on to the top of your bottle of club soda. How much easier can it get than that? Pour the club soda in a spray bottle, or simply screw the spray nozzle right onto the bottle of club soda if it will fit. To use, spray the surface to be cleaned and wipe dry with a soft cloth. It might take just a little more wiping than a commercial cleaner because it doesn’t dry quite as quickly, but the little extra effort will result in a streak free shine. It’s safe – you can leave a club soda cleaner sitting around and it doesn’t matter if the kiddos get into it. It’s a beverage! Have the little ones help with the cleaning and let them spray away! It’s inexpensive – I can purchase a one liter size bottle of club soda for about 85 cents. One liter is about 33 ounces. A bottle lasts me for quite some time and I’ve found that it still cleans well even if it’s lost some of its fizz. The cleaning ingredient in club soda is said to be the sodium citrate which softens the water so it still works even if it’s gone a little flat. It’s easily available – It’s easy to find club soda in the grocery store. It’s always on the beverage aisle somewhere, sometimes closer to the alcohol area than the sodas. It’s multi-purpose – If I’m using club soda to clean my bathroom mirror, sometimes I also use it to my bathroom faucet a quick shine as well as using it to wipe down a few other surfaces. Club soda can be used to give houseplants a dusting and to clean spots on clothing and carpeting. And of course, it works great on windows and glass doors. 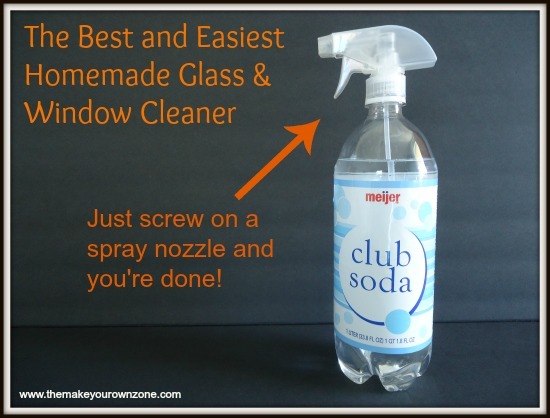 So if you’re looking for a non-toxic, simple, inexpensive – AND – effective homemade alternative to the commercial window cleaners – by all means give club soda a try. I think you’ll love the results. In my opinion, club soda really is the best and easiest homemade glass and window cleaner. Doesn’t it leave a sticky residue from the dugar content? No, I have never had club soda leave any kind of sticky residue. There are extra minerals added to club soda, but there is no sugar in it. Can you use the club soda that you make with a soda maker? I don’t think the store bought has anything other than carbonation to the water, so I will give this a try and post my results. However, well water and or softened water would probably give different results. Putting club soda on my grocery list. Can’t wait to try this. Thank you! Thanks so much for the tip! One question: is the club soda still effective when it goes flat/loses its bubbles? Yes, it still works good even if the club soda isn’t especially fizzy anymore. I’ve been using the cornstarch, vinegar, and rubbing alcohol mixture for a while, and liked it. One down fall it seems to leave a residue the more you use it. So a while back I found that club soda was good for getting out stains. Used it and it worked. Now I found you can use it as a glass cleaner. I just tried it…. and I poured my cornstarch mixture down the drain! Club soda works BETTER! It didn’t seem to take long to evaporate either. Thank you for posting this! My new favorite cleaner is by far club soda! You said the club soda doesn’t dry quickly like Windex. I’m wondering if you can mix a little rubbing alcohol in it to make it dry faster. I think adding some rubbing alcohol could certainly be an option for those who want a mixture that might evaporate a little more quickly. Thanks for the idea! That’s awesome! I need to put club soda on the grocery list and try this out! 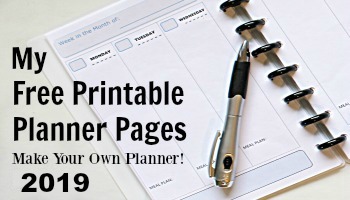 Thanks for sharing this great tip! I really love this! No mixing with stinky vinegar! I was even going to try mopping my linoleum floors with it. Any idea if it’s safe for hardwood flooring? Club soda is a great choice when you don’t want the smell of vinegar. I think you could use it on your hardwood floors if you just damp mop with it and don’t get the floor soaking wet. You could perhaps put a microfiber cloth on a swiffer, and then just spritz the cloth with the club soda and mop the floor. I will definitely be trying this tip. Thanks! Club soda is also good for removing bugs from your car and it will not harm the paint. That’s one use for club soda I didn’t know about. Thanks for sharing!